Elliott Rodgers kept hearing those words coming from his corner Saturday night in the championship match of the 152-pound weight class at Banker’s Life Fieldhouse. With under a minute to go in the match Rodgers trailed Greenfield’s Cooper Noehre 7-4. Rodgers was wrestling for an individual title and a chance to all but secure a team title for the Irish. Rodgers earned an escape point to cut Noehre’s lead to 7-5. Then, with under 10 seconds remaining, he earned a takedown to tie the score and force overtime. It was the third overtime meeting this season between the two rivals. This time Rodgers pulled out a move he has been working on in practice but hadn’t shown Noehre yet – an inside trip. The move worked, and Rodgers won the match. The victory gave him his first state title and helped Cathedral win its second team title in as many years. Rodger’s teammate, senior Jordan Slivka sealed the team championship for the Irish in the next match. Slivka took on Portage’s No. 1-ranked Donnell Washington Jr. in the 160-pound championship. Washington beat Slivka 8-3 during the regular season and appeared on his way to beating him again in the final. Washington took Slivka down early in the match and then cut him (gave him a free escape). Washington continued his dominance for most of the first two periods. Then, in the final minute of the match, Slivka came alive. The Ohio University commit scored seven points in the final minute to win the match 12-7. That victory ensured no other team could catch the Irish in points. 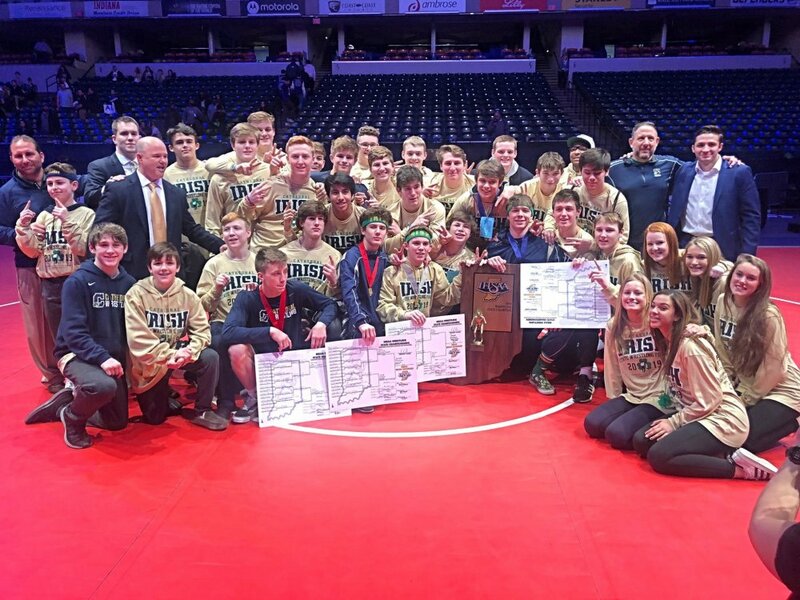 Slivka won his first individual state championship last season, and coincidentally, that victory also sealed the team title for the Irish. Slivka’s wrestling shirt has the word “clutch” on the back of it – one that coach McGinley feels is appropriate for the senior. Going into the final Cathedral looked to be in great shape to claim the team title. The Irish had four wrestling for weight-class championships and a small lead in the team standings. But things got a little dicey in the early goings. Irish freshman sensation Zeke Seltzer lost the 113 pound final to returning state champion, No. 1-ranked senior Jacob Moran of Portage 3-0. Then Cathedral’s Alex Mosconi fell to No. 1-ranked Matt Lee, 5-2 in the 145-pound final. When Avon’s Asa Garcia earned a pin over Roncalli’s Alec Viduya in the 132 pound final, suddenly things got interesting. Avon still had Carson Brewer to wrestle at 182 pounds. Brewer was the heavy favorite in the match, and if he pinned his opponent, Avon had a chance to take the team title. That’s when Rodgers and Slivka stepped up and won back-to-back matches to eliminate that possibility. In all, Cathedral sent five wrestlers to the state tournament. Rodgers and Slivka won their weight classes. Seltzer and Mosconi placed second and Lukasz Walendzak finished 8th at 126. Just an awesome State Finals and so exciting to see the fight for the Team Title between Cathedral and Avon. That kept the night very exciting!